WALSH, WILLIAM, Roman Catholic priest, archbishop, and author; b. 7 Nov. 1804 in Waterford (Republic of Ireland), eldest of 14 children of Joseph Walsh; d. 11 Aug. 1858 in Halifax. William Walsh attended St John’s College in Waterford and then went to the seminary in Maynooth. Ordained at Holy Trinity Church, Waterford, on 25 March 1828, he served as a curate near Dublin, at Clontarf and Kingstown (Dun Laoghaire), for the next 12 years and was also nominated for, but did not receive, the post of vicar apostolic of Calcutta. His notebooks record a busy life during this period: hearing confessions, preaching, saying mass, and tending to the needs of the parishioners under his care. In 1841 his name was again proposed for higher office; this time he was to be appointed to the position of coadjutor bishop of Nova Scotia. 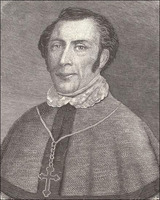 The decision to appoint a coadjutor to William Fraser, vicar apostolic of Nova Scotia, resulted from insistent lobbying by representatives of the Irish Catholic population of Halifax. They felt that their interests were being neglected by Bishop Fraser, who chose to live in Antigonish. On 1 May 1842, in Ireland, Walsh was consecrated titular bishop of Maximianopolis and coadjutor bishop of Nova Scotia with the right of succession. Soon after his consecration Walsh received a petition from 13 Nova Scotian priests noting that his appointment had been made without consultation with either Bishop Fraser or the clergy of the diocese. They blamed the troubles in Halifax on “a contemptable faction of misbehaved Catholics in the Metropolis of this Vicariate.” Walsh immediately wrote to Rome offering his resignation but the Sacred Congregation of Propaganda refused to accept it. Accompanied by Thomas Louis Connolly*, his secretary and eventual successor, Walsh arrived in Halifax on 16 Oct. 1842 and proceeded to Antigonish to meet with Fraser. Although he claimed to have been “most kindly received by the worthy Dr. Fraser,” it soon became evident that his stay in Halifax would prove difficult. Besides not being consulted about the appointment of a coadjutor, Fraser had learned of the appointment not from Rome but from a newspaper article. Walsh’s arrival only served to worsen matters. Walsh found two opposing factions within the Catholic church in Halifax: one, led by Father John Loughnan, vicar general of the diocese, included those who supported the authority of Bishop Fraser; the other, led by Father Richard Baptist O’Brien, a recent arrival from Ireland, included prominent Irish merchants and professionals who had been in favour of the appointment of a coadjutor. Fraser gave Walsh control of the temporal powers of the church in Halifax but left Loughnan as vicar general with jurisdiction over ecclesiastical and spiritual matters. On 3 March 1844 Walsh left for Rome to plead his case personally and to seek an early resolution to the situation. Both Fraser and Walsh agreed on the need to split the diocese but they were at odds on the conditions of such a division. Finally on 22 September the division was made “according to the limits proposed by Monsignor Fraser.” On 20 July 1845 Fraser, without a coadjutor, became bishop of Arichat, which included all of Cape Breton and what are now the counties of Antigonish and Guysborough, and Walsh became bishop of Halifax, which included the rest of the province and the island of Bermuda. With his position assured, Walsh set about building new schools and providing more priests for the diocese. He established convents in Halifax of the Sisters of Charity [see Rosanna McCann*] and of the Religious of the Sacred Heart to teach in the Catholic schools. On 4 May 1852, after Fraser’s death, Walsh was appointed archbishop of Halifax, with jurisdiction over the newly formed ecclesiastical province of Nova Scotia, thus becoming the first archbishop in British North America outside Quebec. His presence in the capital and his enthusiasm offered Catholics a visible symbol of their growing status within the city and throughout the province. He travelled extensively in the archdiocese and encouraged the development of new parishes. He was also a prolific writer of letters, poems, and major works of pious and devotional literature which were published and widely distributed. AAH, T. L. Connolly papers; William Fraser papers; William Walsh papers. Acadian Recorder, 14 Aug. 1858. Evening Express (Halifax), 16 Aug. 1858. David Allison, History of Nova Scotia (3v., Halifax, 1916), 2. A. A. Johnston, Hist. of Catholic Church in eastern N.S., vol.2. T. M. Punch, Irish Halifax: the immigrant generation, 1815–1859 ([Halifax], 1981); “The Irish in Halifax, 1836–1871: a study in ethnic assimilation” (ma thesis, Dalhousie Univ., Halifax, 1977); Some sons of Erin in Nova Scotia (Halifax, 1980). K. F. Trombley [Tremblay], Thomas Louis Connolly (1815–1876): the man and his place in secular and ecclesiastical history (Louvain, Belgium, 1983). J. E. Burns, “Archbishop William Walsh,” N.S. Hist. Soc., Coll., 25 (1942): 131–43. 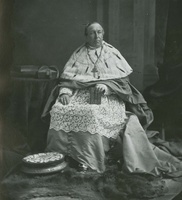 C. M. Kelly, “William Walsh, first archbishop of Halifax (1804–1858),” Irish Ecclesiastical Record (Dublin), 66 (1945): 11–18. David B. Flemming, “WALSH, WILLIAM,” in Dictionary of Canadian Biography, vol. 8, University of Toronto/Université Laval, 2003–, accessed April 24, 2019, http://www.biographi.ca/en/bio/walsh_william_8E.html.